Each year I start seeds in soil blocks for the spring planting. The blocks are fun, easy to make and have many advantages over using trays and pots. Here is my basic recipe. It will create 250-300 medium blocks. Simply mix all of the ingredients in a wheelbarrow and then add enough water to create a peanut butter consistency. Using warm water makes the whole experience more pleasant. I have found that it normally takes about 10 gallons of water. After combining everything let the mud/slurry sit for a few minutes. This allows the coir to soak up as much water as possible. 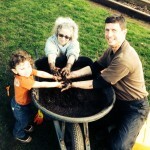 Next, fill your soil blocker, place it on a hard surface and press firmly. 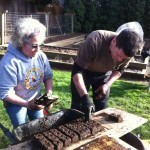 Your goal is to compress the block and allow the extra moisture to exit. It might take a few tries to get it right. The process can be messy. I recommend doing it outside. Now what do I do with these dirt blocks? Even compressed, the blocks can be really squishy at first. You must be very gentle with them. I like to use metal kitchen tongs to move them. As they absorb the extra moisture they will firm up. 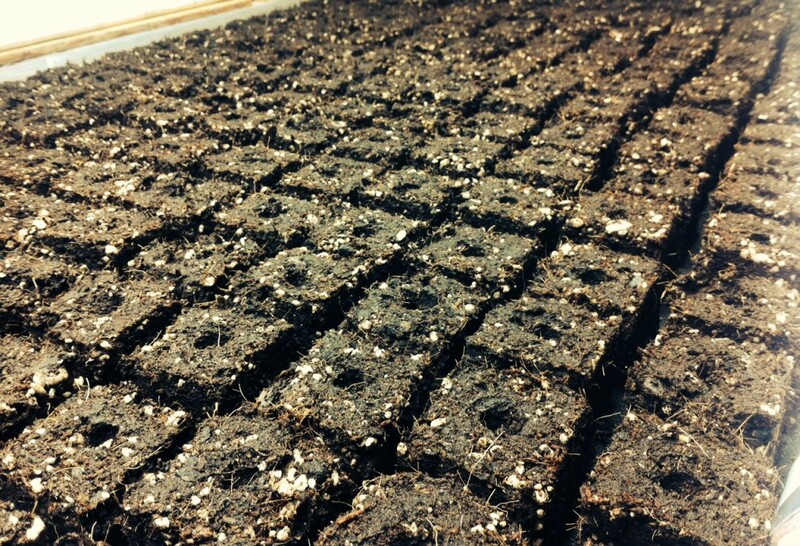 My blocks are placed on a heating pad and enclosed with plastic to help retain moisture during germination. This works really well, but will also cause surface mold to quickly form. Therefore, I recommend the following. After planting some seed in the divot, cover with a small amount of coir. Next sprinkle the blocks lightly with cinnamon. Supposedly, cassia is antifungal I was skeptical at first, but it seems to work quite well. This mixture works great for the medium blocker. 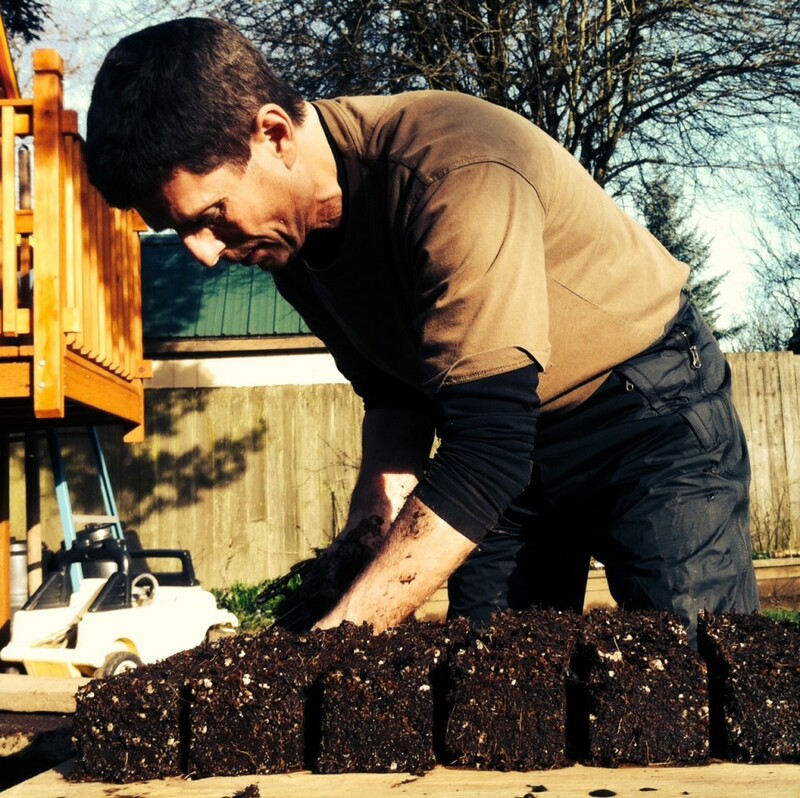 If you are using the mini blocker, you will probably need to use more coir and less soil. 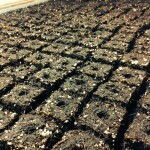 In fact, you might try close to 100% coir as the mini blocks are really just for germination and will need to be potted up ASAP.